Great sound out of a Windows PC! What is JPLAY FEMTO? Here is the definition taken from the JPLAY online manual. JPLAY FEMTO is a complete network music software player for the most demanding audiophile. It consists of JPLAY femtoServer, ultra-light and ultra-optimized UPnP media server & JPLAY FEMTO UPnP Renderer. It supports virtually all audio formats and resolutions including DSD Native (RAW) up to fs256 & DSD DoP up to fs256. It improves sound quality of local library and online lossless music services such as TIDAL & Qobuz (including hi-rez Qobuz Sublime plan). To save you the trouble of looking it up; UPnP means Universal Plug and Play, a standard for network enabled devices to discover and establish connection to each. From this point on, JPLAY FEMTO will be referred to as JPLAY. JPLAY is the newest edition to the very short list of products that can play the full range of high resolution music formats via a Windows based server. The only others this reviewer has experience with are Foobar 2000 and JRiver Media Center. JPLAY is different from the other two in that it is designed to operate from a remote device such as a smart phone or tablet etc. 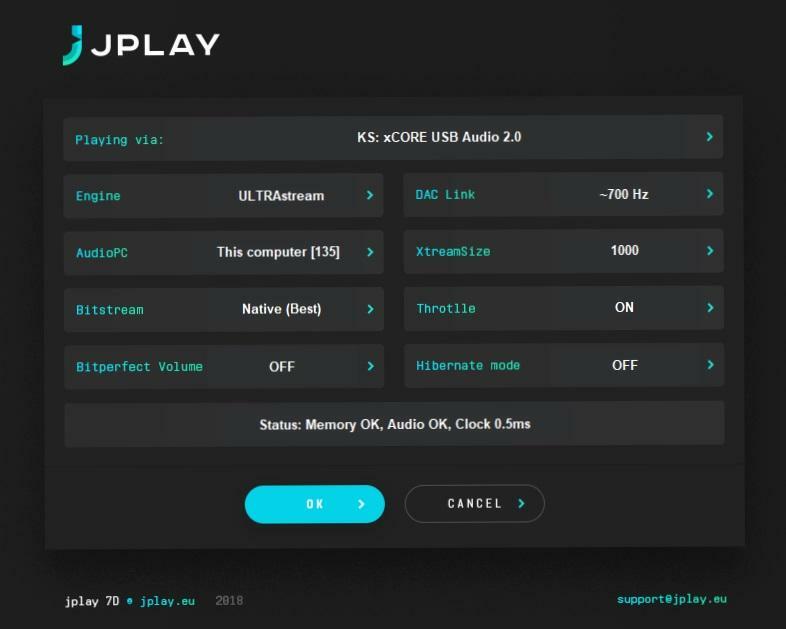 The founder of the company, Marcin Ostapowicz, explained that JPLAY FEMTO was not created to compete with products such as Foobar and JRiver but to provide an audiophile grade alternative. JPLAY sells for 149 Euros which gives you permission to load it on 2 PCs. This is a significantly higher price tag than my JRiver software which will load on multiple PCs and sells for $59.98 US. JRiver gives you free updates, however, when a new edition of JRiver is released you have to pay an upgrade fee. I am using JRiver Media Centre 23 and I don't plan to purchase the upgrade to MC24. JPLAY advertizes lifetime membership and "Premium Support" and like JRiver, new editions would not be free. Installation and setup of JPLAY FEMTO was relatively quick and easy. Previous experiences with Foobar and JRiver had me anticipating troubles. The online manual explains what to do and the Settings box is easy enough to figure out. (see a screenshot of the Settings box below) Marcin Ostapowicz explained that running JPLAY from a remote device removes overhead from the PC where JPLAY resides thus leading to a better sound. In order to run JPLAY from a mobile device, in this case an LG (Android) phone was used, it is necessary to install an App called Bubble UPnP which comes as a free download from Google Play. Note that the App one needs to install depends on which OS is being used. JPLAY was connected and playing to the Doge 7 DAC in a matter of minutes. JPLAY may not be able to communicate with all DACs. There is an extensive list of DACs that have been tested and known to communicate with JPLAY on the their Forum page. The biggest task was pointing the software to the music library and waiting for it to scan all the files. JPLAY was able to play most of the music formats in my library. One exception discovered is WMA files which the player doesn't support, even though it is listed as being supported in the Web manual. Bubble UPnP is not a JPLAY product and it includes some advertizing and as well as some restrictions on use. For example, with the free version one cannot put more than 16 songs in the playlist. Note that the full version costs less than $5. US so not really an issue. Bubble UPnP works fine, seems to be completely free of bugs and the GUI is pretty easy and efficient to use. There are basically 3 pages to swipe through, Now Playing, Playlist and Library. A tap on the Menu symbol brings up 6 more icons for Settings, Themes, Search, Chromecast, Files and a Close button. One must select the JPLAY FEMTO renderer from the Chromecast menu and select JPLAY FEMTO server from the Library menu otherwise you may not access the the correct player. Remember, this App will connect to any library and server it finds on the network, not just JPLAY. In this case, it saw all of the UPnP devices in my house as potential renderers as well as several libraries such as Logitech Media Server and Plex Media Server. My only issue with the remote device approach is that 9 times out of 10 I go downstairs to my music room and realize that I forgot my cell phone upstairs. No cell phone; no acces to JPLAY! I am really not used to dragging my phone around with me all day long in my house. JPLAY will run on a Windows PC via a software package called Kinsky. This is a Linn product that I understand emulates a mobile device and happens to work with JPLAY. The GUI (graphic User Interface) is quite basic. It was found to be very buggy and attempts to use it were quickly abandoned. Of course, installing Kinskey on the same PC as JPLAY, that you just paid 149 Euros for, defeats the strategy of better sound quality by removing tasks from the PC. Bubble was also installed on my wife's Samsung tablet and the appearance and operation was found be be virtually identical to on the LG phone. The information above regarding Kinsky and Bubble was discovered after downloading JPLAY and was not readily apparent on the JPLAY web site. Personally, I have trouble with the idea that one buys a product and, SURPRISE!, you find out afterwards that you have to buy or download something else in order to make it work. If JPLAY claims better sound is obtained by offloading PC tasks to a remote device wouldn't it be logical to mention it prominently on the web page? There is a Forum page that is accessible from the JPLAY web page which may provide a lot of additional information for those interested in learning more about the product before purchasing it. I have not explored this page much yet so I have no comment at this time as to its usefulness. Evaluating any new product is always easier when a familiar comparable is available. In this case, JRiver has been running on my system for a couple of years so it was the obvious choice for comparison purposes. However, there were some complications to deal with. JPLAY will not run if another music player is running on the system. Also, JPLAY played louder than JRiver therefore it was necessary to make a volume adjustment with every switch. Comparing playback at different volume levels is really not reliable. Thus, switching rapidy from one player to another was not possible, it was necessary to shut down one and then launch the other, then adjust the volume. This switchover process being somewhat time consuming, and, as the human brain cannot retain acoustic memories accurately for more than a few seconds, (mine at least) this means that any comparison had to rely on careful separate analysis of each player, breaking down the performance into various characteristics. The volume difference between playback of the same source on the two softwares is puzzling as both were configured for 100 percent volume. Also, frequently noted with JPLAY was a silence of 6 to 10 seconds between playing each track in the playlist. This seems abnormally long but not to the point of being annoying. It didn't happen at all times and no attempt was made to identify any certain set of circumstances where it would occur. JPLAY improved every sound attribute one cares to measure; clarity, detail, soundstage, PRaT, dynamics; everything was better. The combined impact of such an across the board incremental improvement is cumulative and significant. JPLAY consistently delivered a deeper soundstage and increased impression of space around the musicians. JRiver always seemed to be much flatter or 2-dimensional in comparison. The music was more crisp and articulate with improved detail and separation/definition of instruments in the background. On George Duke's Dreamweaver the bass and piano solos on Stones of Orion was more natural and alive. Playing Turn Blue by The Black Keys on JRiver sounded blurred and flatter in comparison to JPLAY. Stephen Fearing's Yellojacket had significantly more airyness and depth. One could feel the room. JRiver didn't come close to matching in this case. The same with Astrud Gilberto's Jungle; with JPLAY there was more air, improved detail and more natural voices. All that being said, it could sound even better. A few months ago we moved into a new house and the music room presently in use is a temporary arrangement in which I have set up my small system. The listening time spent with JPLAY has lead to the conclusion that it's performance is being limited by the hardware in use, most notably the small B & W bookshelf speakers and to a lesser extent the Jaton Operetta amplifier. Being, of course, quite familiar with the characteristics and limitations of these components, I believe that JPLAY is pushing up against a performance wall with this playback system. I am certainly looking forward to the pleasure of listening to JPLAY perform when my best system is up and running upon completion of the music room project. The JPLAY web site suggests that the best sound quality is obtained when the PC is set to Hibernation mode and Marcin at JPLAY confirmed that this is applicable on a case by case basis. This is configured in the Settings menu. However, this mode may not function on all systems or for all DAC Link Rates. In my case it was found that Bubble played fine in both Hibernation On and Off modes at up to a DAC Link Rate of 200 Hz. The maximum rate setting being 1000 Hz. However, turning off Hibernation did not enable operation at a higher rate setting. No difference in sound quality was detected between hibernation being on or off during this review process. It is appropriate to add that this review was done using my existing music PC which does have a few aplications such as Internet Explorer, Gmail, Adobe Reader, and anti virus installed on it and no attempt was made to ensure that these programs were not running in the background during the listening time. JPLAY sounded significantly better than any comparables this reviewer had available. This, in spite of the fact that it was tested on a somewhat limited system and the PC used was not fully dedicated to this application. This leads to the conclusion that up until now the capabilities of my superb Doge 7 DAC. have been significantly under exploited. There is no doubt that many users will consider the sound quality to be worth the premium price. For those reader who are interested in understanding at a more technical level why JPLAY is able to obtain such performance, some explanation is provided on the JPLAY web site under the tab FAQ. This reviewer certainly doesn't have the technical expertise to formulate a comment on the information supplied there. The sound is proof enough! The superior sound quality cetainly outweighs the abnormally long gaps between tracks and the inconvenience to some users like myself of having to carry around a mobile device. The question that begs the asking is "How does JPLAY sound compared to the growing number of dedicated music servers on the market?" That would be a very interesting test.